Scissor Snake Family by ricswika is licensed under the Creative Commons - Attribution license. WINNER Second Runner-Up Support-free Product Design Christmas 2014 MyMiniFactory.com. 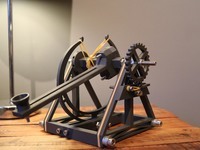 Now on Thingiverse by popular demand. 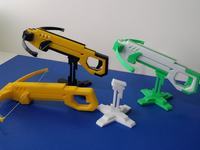 The "Scissor Snake" is a fun 3D printed toy. It is easy to print without support; the "Scissor Snake" comes off the build plate assembled and ready to use. Its motion is incredibly smooth, resulting in a very precise, fast, durable and fun remote grabber. 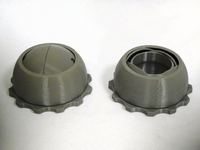 This design uses an exclusive, support-less crossover bearing, engineered for the project. The cross-over bearing interlocks with the frame when fully extended under load, causing the frame to become rigid, thereby reducing stress on the bearing pivots. This results in a strong and durable toy cable of lifting many times its own weight. Kid tested. Guaranteed to provide many hours of fun for kids of all ages. Magnum a.k.a. the Trouser Snake - Another kind of Scissor Snake. Print at 100% scale, using 30% to 50% infill, no support, at 0.2mm layer height. 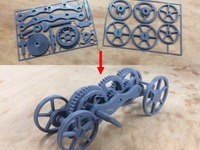 The "Scissor Snake" is designed to print at 100% scale on a wide range of 3D printers. However, if the print comes out looser than you'd like, you can reduce the scale by 5 to 10%; this will produce tighter joints. If the print comes out too tight, increase the scale by 5 to 10%; this will produce looser joints. Normally this is not necessary. Otherwise, for best results, don't change the scale of the model.